The Electrical Conduit Gauge (CG1) accurately measures the “bore” or inside diameter of steel and aluminum conduit ranging in size from 0.5 inches to 4 inches (13 millimeters to 102 millimeters). This is an essential tool for every electrical installation, designed for durability and ease of use. Measurements between 0.5 inches and 4 inches are laser-engraved on the stainless steel face of the CG1, ensuring that they’ll be easy to read even after years of hard use. At the base, a 0.5-inch diameter hole makes the CG1 easy to hang on rack-ends or any protruding nail at an installation site. Keep the Electrical Conduit Gauge handy in the warehouse or at the job. It’s vital to know the exact inner diameter of conduit when planning cable raceway. The National Electric Code (NEC) limits the number of conductors that can occupy a given length of conduit, so accurate measurements of conduit diameter is essential. For that reason alone, there should be an Electrical Conduit Gauge in every electrician’s toolkit. 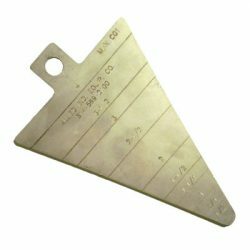 Add to that the fact that this all-steel tool is easy to use and incredibly accurate, and it makes sense to have one available at every job.